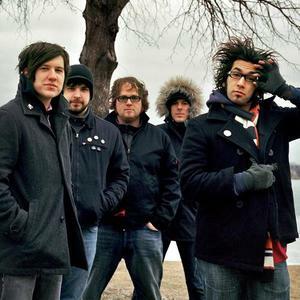 Motion City Soundtrack is a pop-punk band which includes members Joshua Cain (guitar), Tony Thaxton (drums), Justin Pierre (vocals/guitar), Jesse Johnson (Moog), and Matthew Taylor (bass). Following their high-school graduation, Minneapolis, MN natives Pierre and Cain -- both of whom were inspired by Sunny Day Real Estate, Jawbox, The Flaming Lips, and Superchunk -- formed the band in 1999. The pair assembled a temporary lineup and issued a self-released 7" that same year. Later, while touring through Pennsylvania in support of their release, Motion City Soundtrack met Thaxton and Taylor of the Virginia-based band Submerge. The two musicians decided to leave their hometown of Richmond, VA, to join Motion City Soundtrack full-time, and the expanded band soon entered the studio with producer/engineer Ed Rose (The Get Up Kids, Ultimate Fakebook). Three weeks before recording commenced, they were also joined by keyboardist Jesse Johnson (whose personal record label, Ordinary Records, had issued some of Jimmy Eat World's earliest material in 1995) to relieve singer/guitarist Pierre of his synthesizer duties. In June of 2012, Motion City Soundtrack released it's 5th full-length album Go. The album takes the classic clever lyrics and upbeat MCS that we all know and love in a new direction. Editorial Review: "Returning to their longtime label Epitaph to release Go, Motion City Soundtrack present the most mature and developed album of their long career. Continuing a dichotomy between upbeat music and darker lyricism that stretches back to their breakout single 'The Future Freaks Me Out,' Go sees the band both maturing lyrically and musically while reinvigorating the signature melodic, keyboard driven sound that their longtime fans love. Despite the full circle musical evolution they ve undergone with Go, the band members agree that in some ways they feel like the same way they did when Motion City Soundtrack was starting to make their mark in the early 2000s (source below)."